For over 25 years it seems Cloigheann (pronounced klog-in) has had as many member configurations as it does possible ways to misspell the band's name. The band's unique blend of "Bluegrass/Greengrass" makes them a one-of-a-kind traditional Irish and bluegrass roots ensemble - generating a solid mix of original composition and traditional Irish reels, jigs, aires, songs and more. 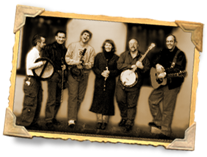 The band members are Larry Green (fiddle, backing vocals), Cathy Wilde (flute, whistle), Donald Caffrey (bodhran, bones), Mike Schroeder (mandolin), Steve Cooley (banjo, dobro, backing vocals) and Mark Rosenthal (guitar, vocals). Founded in 1991 by Mark Rosenthal and Roy Livingston, Cloigheann has been playing in, around, on, and in some cases under the regional Irish music scene ever since. From festivals to pubs to concerts to house parties and weddings, it's all the same to us - great music, and great craic wherever we make it. Cloigheann plays the WFPK Louisville Live Lunch (March 16, 2007). Listen to the live performance!